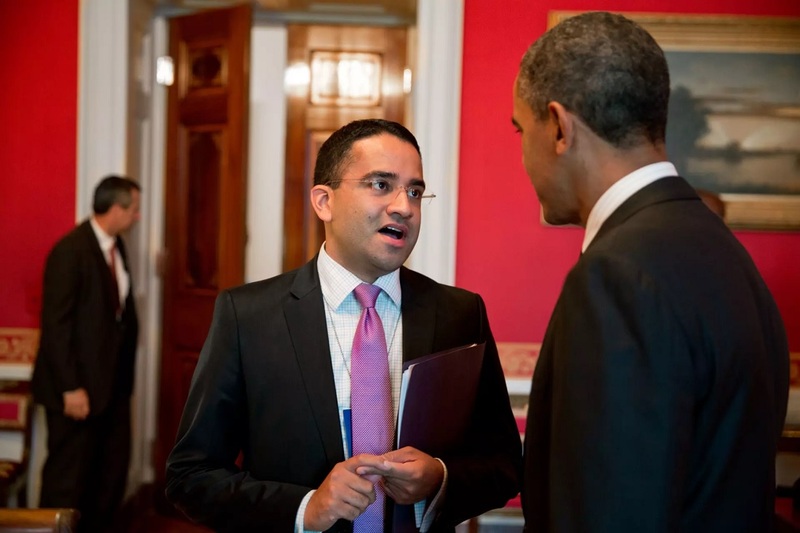 Former Obama White House official Gautam Raghavan speaks about West Wingers, a new book on the Obama presidency that he edited. 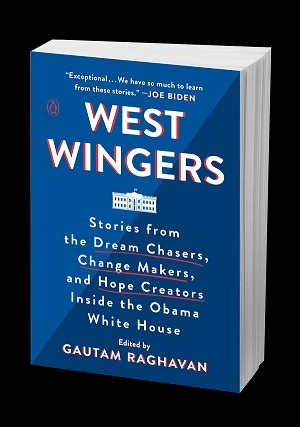 West Wingers: Stories from the Dream Chasers, Change Makers, and Hope Creators Inside the Obama White House, a new collection of essays by 18 former Obama White House officials, hit the book shelves on September 25. Edited by Gautam Raghavan, the book takes a behind-the-scene look at the Obama presidency, and covers moments, events, and trends over eight years of the Obama presidency. Besides Raghavan, the contributors include two other South Asian Americans: fellow Indian American and former Obama speech writer Aneesh Raman and Bangladesh America Rumana Ahmed, who served as liaison to Muslim American and other communities in the Office of Public Engagement. In an interview, Raghavan, who was the president’s liaison to the LGBTQ and the Asian American and Pacific Islander communities from 2011 to 2014, speaks about the book. Prior to joining the White House, an alumnus of Stanford and George Washington University, served at the US Department of Defense, where he was part of “Don’t Ask, Don’t Tell” working group. Currently, he is the executive director of the Indian American Impact Project & Fund. How did the book idea originate? Believe it or not, my dad first made the suggestion that I write a book about my time in the Obama White House. I didn’t think too much of it at the time — but all that changed after the 2016 election. By then, I had been out of the White House for a few years and had time to reflect on what a special place it was, and in particular, the phenomenal people I worked with. Given the change of Administration, I also felt increasing urgency to capture what made the Obama White House special and ensure our stories were told. You wanted the book to provide new ways of understanding of the Obama presidency. The book’s a very “Obamasque” subtitle, “Stories from the Dream Chasers, Change Makers, and Hope Creators,” pretty much sums it up. Would you call this a first draft of history of the Obama administration? Each writer has a compelling story. For you, as an editor, what are some of the highlights of the book? It’s hard to pick just a few! But I do want to highlight two stories for readers of The American Bazaar. The first is by Aneesh Raman, one of the President’s speechwriters. In his story, Aneesh reflects on writing President Obama’s major speech on immigration reform while tracing his own family’s immigration story from India. The other is the story by Rumana Ahmed, a Bangladeshi American Muslim woman who wore hijab and worked for the National Security Council. Rumana writes about her own experiences with Islamophobia and the sequence of events that led to President Obama’s mosque visit. In the West Wing you had two roles: you were liaison to the LGBTQ and AAPI communities. What was the highlight of your White House stint? I will never forget our 2013 Diwali celebration with First Lady Mrs. Obama. In addition to hosting a grand Diwali party in the East Wing, Mrs. Obama also participated in a Bollywood dance workshop with local students — of every race, including many desis — choreographed by Nakul Dev Mahajan. The photo of her rehearsing with the students always brings a smile to my face. The Obama White House was one of the most diverse ones in this country‘s history. The current White House is comparatively much less diverse. What is your take on that? The diversity of the Obama White House was not just a reflection of the diverse coalition of Americans who supported the President, but importantly, also an active effort by the President and his team to recruit and hire people who come from every background. Currently you’re running Indian American impact fund, which is working to elect I need American Democrats to office across the country. Tell us more about the organization. For too long, Indian American candidates have been left to run on their own without any infrastructure or support. Raj Goyle and Deepak Raj established Impact to help talented candidates who reflect our community’s values run, win, and lead. This year, over 100 candidates ran for office — a record! — and we are working to help elect the most qualified of these women and men this November.